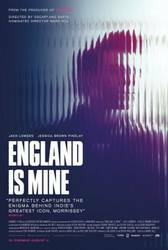 Mark Gill's England Is Mine introduces Morrissey while he's on the cusp of adulthood, an enigma of cocksure arrogance presented in the body of a slightly hunched over, uncomfortable young man. A number of key characters in the Mancunian singer's formative years, including the often overlooked Anji Hardy (Katherine Pearce), who died of leukaemia in 1977 and was a strong influence on a teenage Morrissey, and his longstanding friendship with artist Linder Sterling (Jessica Brown Findlay), feature in the film. We see Morrissey as the frustrated Inland Revenue employee who butts heads with his unimpressed boss, we get a glimpse of the isolation the character felt when his friends made the inevitable move to London, and we see him transform from a mop-haired, nervous music fan into a bequiffed frontman. While Jack Lowden gives a nuanced, earnest performance as the singer, we never truly get to see any of the character's depth. The film will undoubtedly be of interest to Morrissey completists, but there is little to take from it for someone with only a passing interest in the singer. We rarely get to see what's happening below the surface of the character, and, in truth, this means the majority of the things that make Morrissey such a fascinating figure don't get an opportunity to shine through. There are occasional moments of comic relief that hint at the acerbic wit that elevates Morrissey beyond the mopey teenager his character embodies, such as when Morrissey's workmate Chrissie (Jodie Comer) blackmails him into going on a date with her, and when she asks what food he'd like he quips, "I don't care as long as it's poisonous". These comic moments can't salvage the fact that the character isn't particularly unique, and while amongst all of the self-assured hubris we find that the character is a little scared and a little unsure, it still feels like a familiar film format. Unlike similar music-focused films like Control or Nowhere Boy, which can function as stand-alone films, England Is Mine would be unremarkable were it not for the fact that the film centres on a figure that would eventually go on to form a musical partnership on a par with Lennon and McCartney, and attract a deity-like status amongst his most committed fans. In one of the last scenes Morrissey goes to a nightclub, standing upright and confident, surrounded by other young people but only paying attention to the music coming through his headphones. That's when you realise he is finally, comfortably, in his own world, and what a shame it is that we never get to see more of that side of him. Perhaps most disappointingly of all is the bit-part role that music plays in the film. While a convivial cover of the Shangri-Las' 60s hit "Give Him a Great Big Kiss" is delivered when Morrissey takes to the stage, and the soundtrack contains music from his beloved New York Dolls and Roxy Music, it still seems lacking. Gill couldn't secure permission to use any of Morrissey's music for the biopic, and it's a glaring omission, particularly when Johnny Marr (Laurie Kynaston) finally teams up with Morrissey at the film's end. England Is Mine does give life and colour to the somewhat dreary and grey streets of 70s and 80s Manchester, but sadly falls just short of doing the same for the film's titular character. Posted Dec. 11, 2017, 6:23 p.m.
Posted May 20, 2014, 2:53 p.m.